Let's get ready to rummmmmmmble! I'll be doing reviews on all of those products soon (especially Obia and Purgasm). But for this head to head, I wanted to compare two products that make similar claims. Ready? Let's go! Polyacrylate-14: polymer for hair styling that combines long-lasting style support and exceptional humidity resistance. Carbomer: Emulsion (mix) stabilizer, viscosity increasing and gel forming agent. PVP: Polyvinylpyrrolidone, a faint yellow solid polymer that helps to keep oils and liquids from separating. PVP also acts as a sealant, forming a thin layer over hair to retain moisture. Triethanolamine: Alkaline substance used for pH adjustment, fragrance, and as a surfactant. And the Winner Is: In this round, the superior ingredient list goes Goddess Curls, by a narrow margin. They both have humectants high on the list, as well as other random polymers and whatnots. But what gives Goddess Curls the edge is the Mango Seed Butter. Seeing butters and oils (organic at that) within the top 5 or 6 is always a good thing. Especially for a gel. Goddess Curls: For about $8.99, you can grab an 8oz bottle of this product from Sally Beauty Supply or Target. Bonus: the price for Sally Beauty Club Members is about $1 cheaper. If you purchase Goddess Curls from their website (www.curls.biz), it will cost you $14. I don't know why. Jelly Soft Curls: Every time anyone says "Miss Jessie's", the automatic word association is expensive. But this product retails for the "introductory price: of $14 at Target and online at www.missjessies.com for an 8.5oz tube. The Claim: This botanical gel will banish frizz, define and hold your curls in place - without the stiff, crunchy feeling that most gels give. Alcohol and protein free. Ideal for humid climates. Great for all curl types. The Truth: By golly, a product bottle that doesn't lie! I rocked my wash n' go curls for 3 days before washing. I honestly could have gone longer, but my hair was dirty from workouts and whatnot. My curls were touchable, defined, and quite literally popping. I became INSTANTLY enamored with Goddess Curls. I feel as though this is the product I've been looking for! Something that plays nice with other products while giving me EcoStyler level hold (minus the super crispy). I also like that it is textured more like a serum or a liquid gel. The Claim: A man on the moon. Stay-on lipstick. Fat-free ice cream. At one time, all these things seemed impossible, but they all exist now. Finally, you can add Miss Jessie’s innovative Jelly Soft Curls hair gel to the list of impossible things – now, made possible! 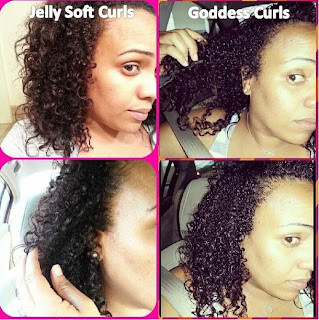 That’s right, Jelly Soft Curls is your next must-have styler because it is specifically designed to leave your curls touchably soft and crunch free while at the same time giving your curls the shine and hold that you love. Don’t believe it? Try it! Simply squeeze out a quarter size of Jelly Soft Curls into your palm, and apply it section by section to your damp (not wet) curls covering your entire head. Get ready for your shiniest, smoothest, softest, and sexiest curls ever. Touching is believing! All curly good things are possible with Miss Jessie’s products. The Proven Expert in Curls. Period! 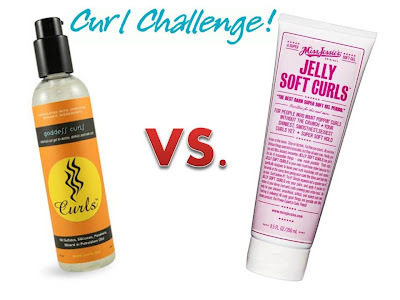 The Truth: Jelly Soft Curls did a pretty good job at defining my curls. It definitely made for a softer looking hold, but I didn't get the 100% definition I was looking for. For the thickness, I expected it to pack a little more punch. The texture is pretty close in viscosity to EcoStyler; it is undeniably a gel. Bonuses: I really like the fact that this product is unscented and uncolored. Pretty rare these days! I've also discovered that it "plays nice" with many leave-ins and moisturizing products, making it the ideal partner in the 1-2 punch for popping curls. Drawbacks: By day 3, I did need to add in some moisture. I guess the humidity blocking powers of this gel are really at work! Bonuses: Some of Miss Jessie's products tend to be artificially colored some rather strange hues for hair products (like baby blue, bubble gum pink, and Easter purple). But they got it right with Jelly Soft Curls. This product is C-L-E-A-R. Thank you! Drawbacks: Artificial fragrance. Although it isn't terribly overpowering, it is reminiscent of fabric softener. Some may like the fresh fragrance. I also found Jelly Soft Curls to be a little drying, and in need of moisture which proved to be difficult in terms of pairing products. It doesn't play too nicely with others, lending itself to buildup flaking quite easily. And the Winner Is: By a close margin, Goddess Curls. Being able to play nicely with others is HUGE, especially products outside of your brand. It mixes nicely with other Curls products (like Cashmere Curls), Eden BodyWorks products, Shea Moisture Products, and tons of other leave-ins and Conditiones. Jelly Soft Curls, not so much. It was almost as difficult to pair as EcoStyler. I've totally been stalking your blog lately trying to get info on the MHM - which I am going to brave this month. I just bought this gel (CGC) as a total impulse buy KNOWING it wont work (I'm crazy) and then I stumbled upon this. I'm too excited to try this...I happen to have some Curls Crème Brule so I'll be pairing them. Thanks for the review! Yay!!!! Let me know how it works out for you! This is an excellent review. I enjoy the battle between this product. The way you describe all the experiments is really very nice. Thank you for your nice sharing and experiment.